adventures of an almost 40 year old intern...: Thanks to KTLA!! 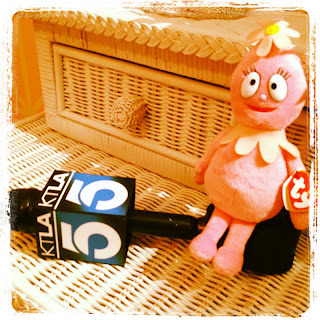 Sending a great big thank you to Allie Mac Kay and the folks at KTLA Los Angeles! Wow! It was an early morning but a fun one (I've been up since 3:30! Yikes!) ! 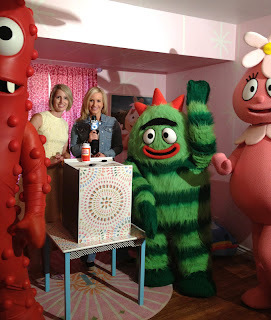 For those of you stopping by for the first time and wanting more info on the Yo Gabba Gabba / Habitat for Humanity of Greater Los Angeles kids room I created you can go here for final room reveal photos! For full directions on the sticker decoupage you saw me demo go here and check out the T-shirt pillow DIY instructions here! And if you want links to ALL of the DIY projects (because there were lots!) in the room along with directions you can get them here! If you don't live in Southern California and have access to KTLA and want to check it out you can go here to watch me demo the sticker decoupage with Allie. And here to see me demo the t-shirt pillows. Last but not least, thank you to the fab folks at Wildbrain and Habitat for Humanity of Greater Los Angeles for asking me to be a part of such a fun project! I love this idea. The stickers are adorable. inspiring friends again.... DIY painted curtains!